Prepare Manischewitz® Rice Pilaf according package directions, using Manischewitz® Beef Broth instead of water. Set aside. Place diced sweet potatoes in shaker bag provided in the Manischewitz® Potato Roasters package. Empty seasoning mix into bag. Shake until potatoes are evenly coated. Place potatoes onto a large cookie sheet that has been sprayed with non-stick cooking spray and bake 15 minutes until they are crispy. Set aside. In a large skillet, sauté the spicy sausages in olive oil 2-3 minutes per side. Remove sausage from skillet and set aside. Add figs, cut side down to the sausage pan and sauté 3 minutes. Flip figs over skin side up, and drizzle with honey. Mix and cook on medium heat 4-5 minutes or until tops have caramelized. Remove from stovetop. Mix the cooked sausage and pilaf mixture together. Salt and pepper to taste. 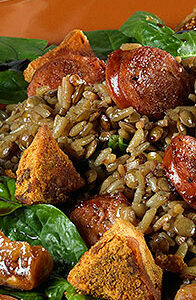 Lay spinach leaves on a plate or platter and spoon the sausage pilaf mixture over the leaves. Add the caramelized figs. Top with sweet potato croutons. Drizzle with balsamic vinegar. Serve warm or at room temperature.